I just joined IllustratedAtcs.com and signed up for my first card swap over there. We were to make cards based on the work of Amedeo Modigliani (1884-1920). 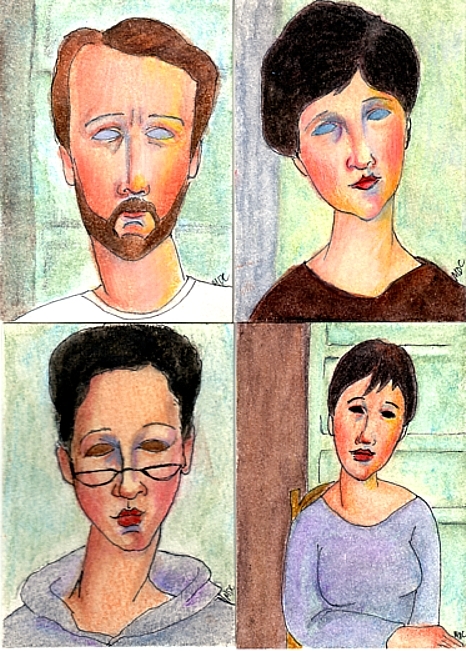 I’ve always liked Modigliani, so it was fun to make these cards. I managed to squeeze a self-portrait in. I’m the one with the glasses. Michael makes an appearance as well. IllustratedAtcs.com is an atc trading group that is for people primarily interested in hand-drawn and hand-painted cards. Even if you aren’t interested in trading you should definitely check out the gallery and see some of the work on display there. These are amazing!!! Recognized you immediatelt, but you do really look like a Modigliani woman. What fun. These are wonderful! Love the Modigliani cards Mellanie. Michael looks particularly good. I am still trying to get to see the film. The ATC gallery has got some amazing images. It must be difficult to get so much detail in the ATC size. You have sensitive drawing style. Keep up the good work. I love the Modigliani cards. Very nice work! Did you ever see the Modigliani movie starring Andy Garcia? What a tragic life. Thanks for the lovely comments. I am so pleased that you like these. I didn’t know that there was a film based on his life. I must go check that out! These are amazing. How long does this take you to do one of these? Love it! That’s one of my favorite artists.